Sapphire is an extremely useful electro-optical material because of its excellent transmission characteristics and mechanical strength. The list of the applications and industries that use sapphire serves as a testament to the versatility of this technology-enabling crystal. For example, sapphire components can be found in medical equipment, lasers, satellites, aircraft, flame detectors and watches. Because of sapphire’s scratch resistance, it is becoming a material of great interest for consumer devices such as the lens cover in smartphones and perhaps someday the phone’s faceplate. Furthermore, recent advances in sapphire crystal growth technology and fabrication have improved the performance, purity, and availability of sapphire for all types of applications. The quality of a sapphire is determined by how closely the grown crystal matches the ideal structure with respect to the arrangement of atoms within the lattice, dislocations, defects, and stress. The root causes for these problems often originate from insufficient purity of the starting material and the growth process itself. The effects of these variables in the final product are commonly quantified by three metrics: chemical analysis, X-ray rocking curves, and optical transmission. Additionally, the observance of bubbles in the crystal provides a baseline from which crystal quality is determined because bubbles serve as scattering centers for any light transmitted through a sapphire optic, thus reducing its performance. The origin of impurities in the crystal can be understood by analyzing the chemical purity of the raw material. Permissible impurity levels differ for each element but are typically less than two parts per million (ppm) for optical grade sapphire. Titanium and chromium, for example, must be kept below 1 ppm because these atoms are color centers that result in pink crystals if their levels are not kept in check. Rubicon Technology uses two types of raw material, purified alumina powder and Verneuil sapphire, often referred to as “crackle.” Alumina powder purchased from the vendor contains several elements (e.g., Na, Si, Cl) that exceed acceptable levels. Rubicon developed an in-house purification process that converts the raw powder into densified pellets suitable for our crystal growth process without an increase in cycle time or decrease in crystal yield. The presence of certain elements can vary drastically between suppliers, and sapphire manufacturers must exercise proper quality control. The data in Table 1, collected by glow discharge mass spectroscopy (GDMS), depicts the most commonly measured impurities found in sapphire. The purity of Rubicon’s ES2 sapphire is shown in column 1, compared with published data from a competitor using the Heat Exchange Method (HEM) shown in column 2. 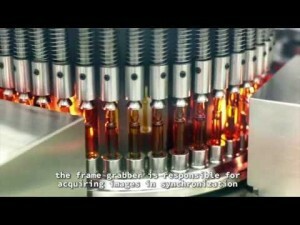 Rubicon’s material exhibits significantly higher purity levels that can lead to improved optical performance for the end user. Table 1. Elemental analysis obtained by GDMS for sapphire produced by two different growth methods. Rocking curves obtained via X-ray diffraction is another useful metric for analyzing sapphire because the width of the resulting peak is highly sensitive to strain and defects within the crystal. A narrow peak, indicated by its full width at half maximum (FWHM) measured in arcseconds, signifies a high quality crystal free of low-angle grain boundaries and lattice strain. A standard rocking curve for Rubicon’s ES2 sapphire windows is shown in Figure 1. Figure 1. X-ray rocking curve for Rubicon ES2 sapphire with a peak width 9.29 arcseconds, indicative of extremely high quality, stress free crystals. The data was collected at the Advanced Photon Source at Argonne National Lab with the help of Albert Macrander. 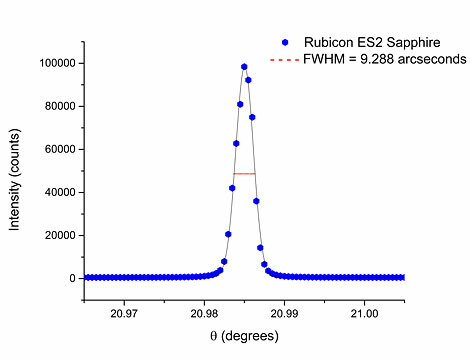 Typical results for sapphire are in the range of 20 to 30 arcseconds whereas Rubicon’s material has a FWHM of 9.29 arcseconds, an indication of excellent atomic uniformity. Such a narrow peak width is obtained through careful optimization of the sapphire growth process. High thermal gradients, fast growth rates, and impurities contributed by the surrounding insulation can introduce defects and stress into the crystal that subsequently yield poor results in rocking curve data. By accurately controlling the temperature gradient and maintaining a stable growth interface throughout the entire process, Rubicon is able to produce near-perfect crystals, ensuring the highest possible performance for optical systems. 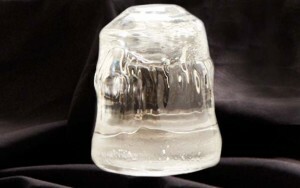 Sapphire exhibits excellent transmission in the ultraviolet (UV) to the mid-infrared (IR) range (~200 – 5000 nm), but poor crystal quality can significantly increase absorption. As discussed earlier, impurities such as titanium absorb certain frequencies of light, reducing transmission. Furthermore, conditions within the furnace can induce subtle interactions between the molten sapphire and the growth environment, which may impact optical performance. For example, insulating materials such as carbon can create a reducing atmosphere resulting in oxygen vacancies within the sapphire that reduce transmission at certain wavelengths. Figure 2 shows the transmission as a function of wavelength in the UV range for two sapphire samples from different producers. The impact of the growth environment is clearly observable, with the commercial sample exhibiting a sharp reduction in transmission at 200 nm that is absent in the Rubicon material. 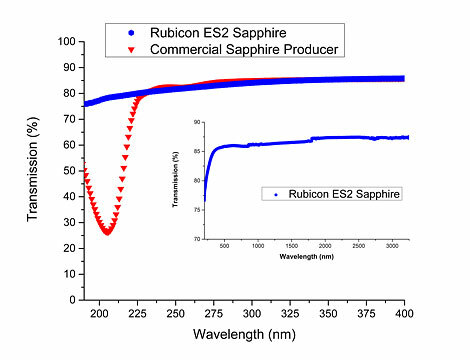 By controlling the growth environment Rubicon routinely produces sapphire that maintains excellent transmission at 200 nm through the mid-IR for demanding UV applications as demonstrated by the absence of any large absorption regions in the UV through IR (Figure 2 inset). Figure 2. Optical transmission of sapphire depicting a sharp absorption peak at 200 nm for sapphire produced by a commercial producer that is absent in sapphire grown by Rubicon. Inset: Optical transmission for Rubicon sapphire from the visible to mid-IR range approaching 90% due to the high quality of the material. Written by Jonathan Levine, PhD, who is Director of Technical Business Development at Rubicon Technology in Bensenville, Illinois.